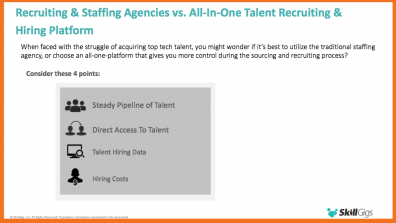 When faced with the challenge of acquiring top talent, most businesses turn to staffing agencies. But staffing agencies have high costs, and don't return the best results. 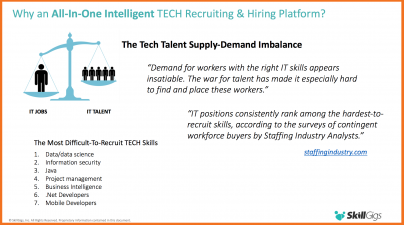 Download this Free Guide to learn how recruiting platforms can lower your costs and help you find the best talent. Tradition recruiting and staffing agencies.... utilize their “rolodex” to bring you a FEW “good” tech candidates. Many times the talent brought to you by traditional recruiting agencies is talent they have found in advance and are trying to pawn off on available companies. Download the Free Whitepaper to Learn More! © 2016 SkillGigs. All rights reserved.